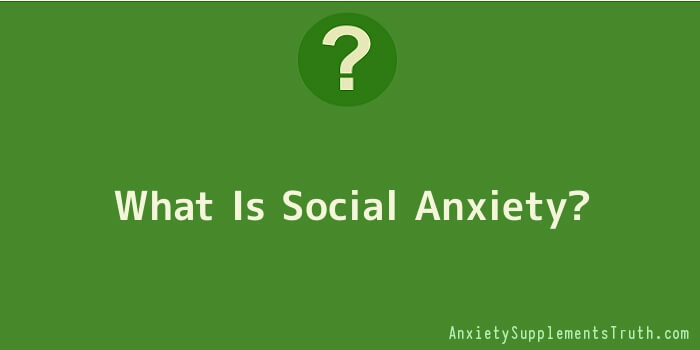 Individuals who suffer from social anxiety disorder have a strong fear of being in social situations. These fears generally are excessive and unreasonable, meaning they come from thoughts that are over-analyzed inside of the person’s own head. Most sufferers think that whenever they go out in social situations they are going to be judged, watched and harshly criticized by other people around. When a person with social anxiety disorder goes out in social situations, they fear that they are going to do something wrong. This could be falling, walking into the wrong building or a number of other things. They think that other people are going to make fun of them, which causes extreme embarrassment and humiliation. A lot of sufferers don’t have strong social skills because of this fear and are not able to function in most social situations because they could break down and have a panic attack pretty quickly. When a person with social anxiety does go out in social situations, they are going to feel scared and stressed out before they even get there. Once they arrive they could end up being unreasonably nervous and breaking down within only minutes. What Types Of Social Situations Will Create The Biggest Anxiety? There are a lot of situations that provoke anxiety in each individual. Everyone is different, so each trigger is going to be different. For example, one person might be scared of going out to a restaurant while another might be fearful of walking into crowded areas. There are also a variety of other triggers that can create strong feelings of anxiety. These situations include: eating in front of others, using public bathrooms, talking on the phone in public, being the center of attention in a crowd, interacting with people, going on a date or even asking questions to someone else. If you feel that you or someone you know has social anxiety disorder, it’s important to look for the symptoms. The biggest symptom is feeling extreme anxiety that is unbearable whenever you are inside of a social situation. If you start to avoid that situation from then on, this is another big sign. Your body will also start to change when you are in an uncomfortable area and your anxiety gets extreme. This can include: increased heart rate, sweating, shaking, upset stomach and more. What Are The Causes Of This Disorder? Each individual is different, so there is not just one cause that makes this disorder occur. There are a variety of different factors that can create unreasonable fear inside of a person. Sometimes this disorder is all psychological and created from embarrassing moments in the past. Environmental causes, like watching someone else make a mistake and be made fun of, is another common cause. Sometimes, the cause can even be biological, from an imbalance in serotonin. Not having the right balance of this neurotransmitter can end up causing delayed and inappropriate reactions to many social situations. Individuals who suffer for social anxiety disorder do have treatment options available to help soothe their fears. Medication is one of the most common treatment options because it helps block physical reactions and keeps the mind thinking more positively. Antidepressants like Paxil and Klonopin are both some of the most common medications that are prescribed to individuals. Each person is different, so some people might not be the right candidates to take these. There are a lot of side effects that are seen as a result of taking antidepressants and other medications. Generally these just change the chemistry in the brain for reactions to certain situations, but everyone reacts differently. Cognitive behaviour therapy is another common treatment option. This is the most effective treatment because it actually redirects the thoughts that a person has through cognitive therapy. When an individual does this, the therapist will work with them to create a different reaction to social situations so they don’t have fear. They will desensitize the sufferer from having the nervous reactions in the situations they tend to avoid the most. After several sessions, the therapist will take the individual out into the situation in small doses until they are able to handle it by themselves.